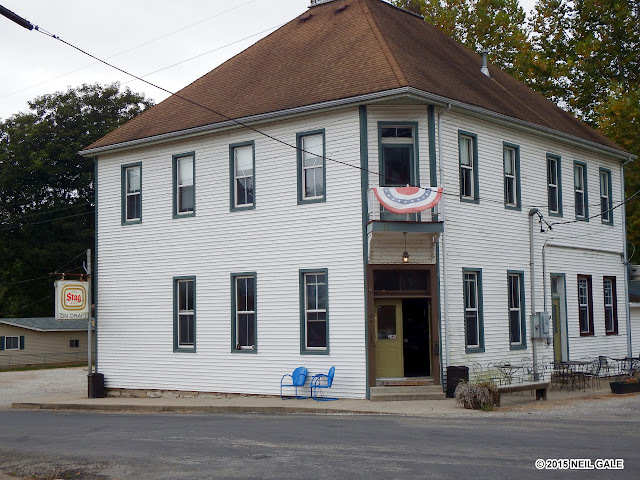 The Digital Research Library of Illinois History Journal™: The 1852 German Village that time forgot, Maeystown, Illinois. 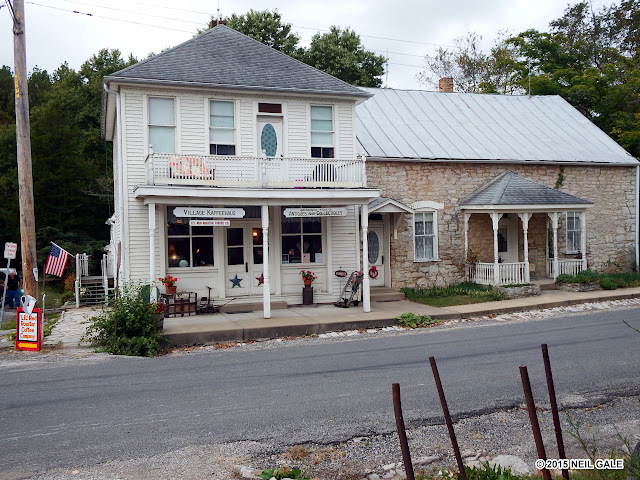 The 1852 German Village that time forgot, Maeystown, Illinois. The Village of Maeystown, Illinois, founded in 1852, is on the National Register of Historic Places since 1978. Nestled in a small valley between the bluffs that make up the Illinois side of the old American Bottom, a wide expanse where the Mississippi River once flowed, is the little old-world village of Maeystown, located in the southwest portion of Illinois, about five miles from the Mississippi River. 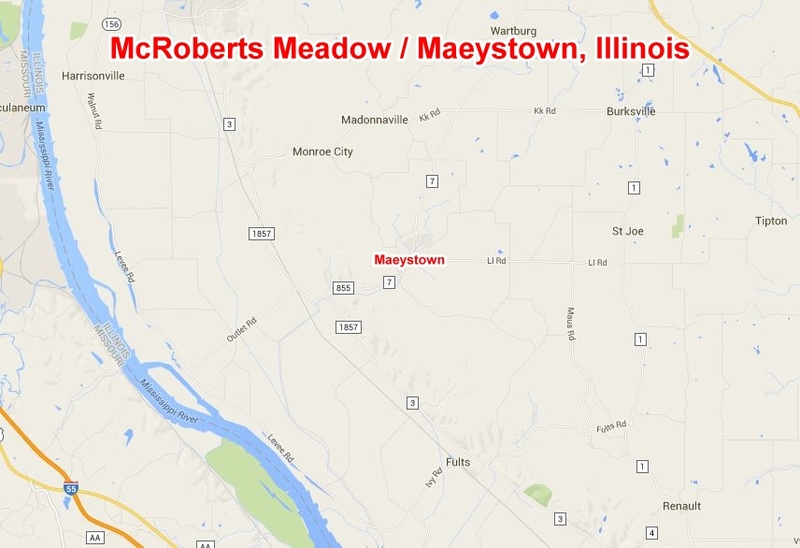 Before it came to be Maeystown, the land was known as McRoberts Meadow. The general area in which Maeystown rests has great historical significance. Captain James Moore, a Revolutionary War soldier serving under George Rogers Clark, founded the first permanent American settlement in the Illinois territory in this area. Moore fought with Clark at Kaskaskia when Clark captured the Illinois country for the Governor of Virginia. After seeing the advantages of this new territory, Moore returned to Illinois with his family and other pioneers in 1781 and eventually settled on the land to be called La Belle Fontaine on the Kaskaskia Trail. Founded in 1782, La Belle Fontaine (now in the town of Waterloo, Illinois) lies about nine miles north of the current site of Maeystown. Moore named the settlement after a nearby spring the French called La Belle Fontaine or beautiful spring. Soon, other adventurous pioneers journeyed to La Belle Fontaine to stake their own claims in this new territory. James McRoberts was one of these adventurous pioneers. Used for Building Foundations and Street Gutters. James McRoberts was a Revolutionary War soldier who was born in Scotland in 1763. His family immigrated to the United States in 1772 and settled in Washington, Pennsylvania. In 1779, when McRoberts was barely sixteen years old, he joined the militia to fight in the American Revolution. After the war, he settled in Kentucky and spent a great deal of time exploring many of the new territories around and west of the Mississippi River. It was during these explorations that he saw the advantages of living in the Illinois territory. During his first trip there in 1786, he bought and temporarily settled on one hundred acres of hilly land (Claim 316) where three streams descend the bluffs, in what was to become Monroe County. He attempted to clear the hundred acres that were to become Maeystown to entitle him to the grant he soon acquired. In 1797, five years after his marriage, he and his wife moved to Illinois from Tennessee and settled on Claim 315, which was a mile north of Claim 316, on a militia grant from the government. Their permanent house was completed in 1798 and his family of ten children lived there for nearly fifty years, supported by working as farmers. As a farmer, McRoberts saw the value of the land in this part of Illinois, and avidly encouraged the settlement of others in the area. After years of holding prominent political positions in the county such a Justice of the Peace, County Judge and County Commissioner, McRoberts passed away in 1844. McRoberts wanted Claim 316, then known as McRoberts Meadow, to be sold by the executors of the will. The Meadow changed hands in rapid succession, and in 1848, it was sold it to Jacob Maeys, the eventual founder of Maeystown, for $200.00 ($5,400.00 in today's dollars). Entering Maeystown, one gets a rare glimpse into the past and feels as if they are in another country. The landscape, houses, roads, stone bridge and stone church all come together beautifully and leave one with a sense of the town's history, of its uniqueness. 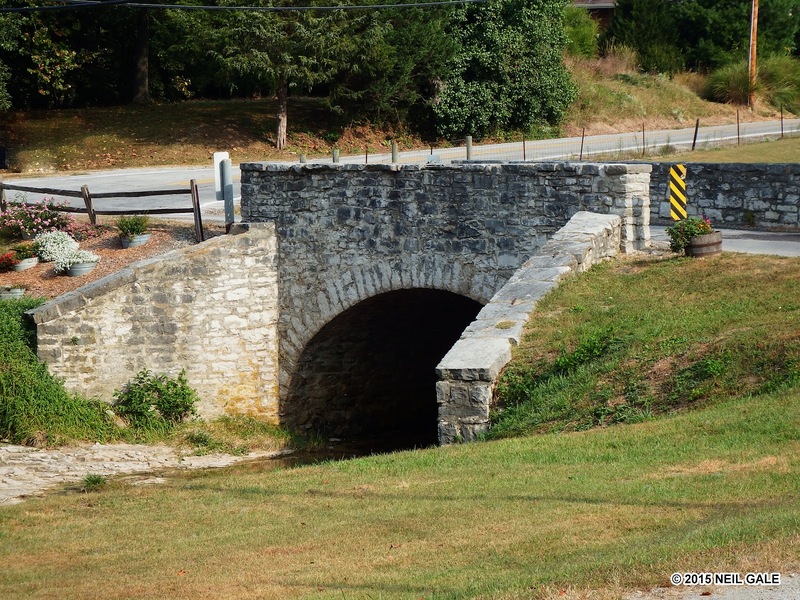 A historic stone arched bridge leads one into the community of quiet streets lined with nineteenth century stone homes and structures, uninterrupted by modern buildings, such as fast-food restaurants, gas stations and convenience stores and modern traffic lights that would take away from the town's historic character. Some small towns telegraph their history as one approaches. Maeystown is that kind of community. Stone one-lane bridge into Maeystown, still in use today. 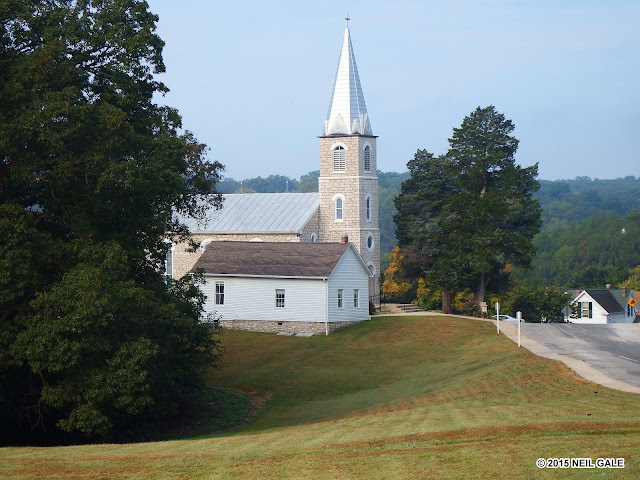 The village does not hold a claim to any part of American history; nothing particularly noteworthy has happened here, but is noticeably different from other Midwestern towns. Maeystown is unique in that all of its early settlers had something in common: they all came from German origins. As a result, walking the streets of Maeystown is the same as walking a street in Germany. That is how eerily similar the town is to the homeland of its founding citizens. Corner George Inn Bed & Breakfast in Maeystown. Southern Illinois is known for its rugged, natural beauty. With all of its fertile land surrounded by wooded, hilly terrain along with its flowing springs and streams, one can see why immigrants wanted to settle in this beautiful setting. A landscape with these criteria was exactly what German immigrants were looking for to lay down new roots. However, many may not realize that this type of landscape can be found throughout various areas of Germany. When German immigrants came to Illinois, they settled in areas such as Maeystown because this was a landscape that they knew, a place where they were comfortable living. In their new world, they wanted a landscape that would remind them of home. 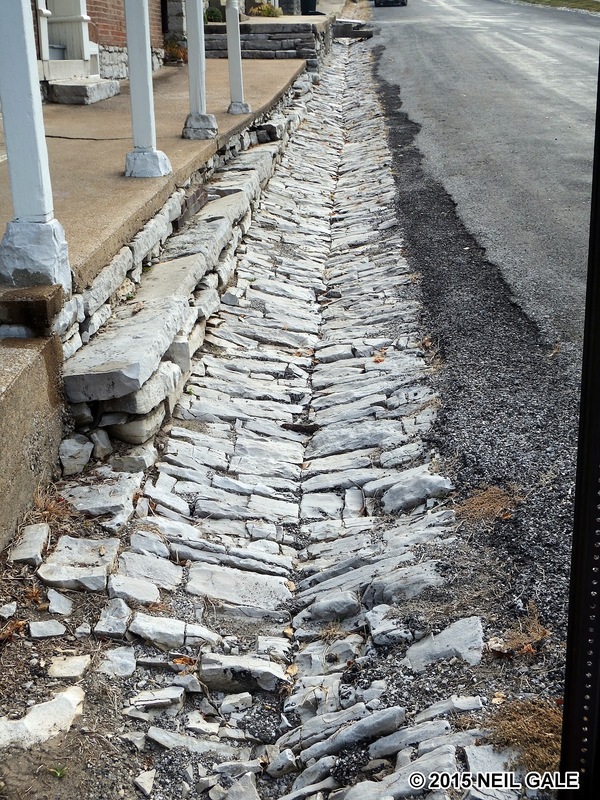 Also, readily available limestone was a desirable feature for a new settlement area because of its building purposes. Due to the surrounding limestone bluffs and the previously mentioned advantages of the area, Maeystown must have been a dream-come-true for the early settlers. Once immigrants settled here in Maeystown, they did not leave and move farther west for the most part they stayed and enjoyed their new home. Jacob Maeys was born in 1828 in Oggersheim, New Bavaria, which was an area in today's German state Rhineland-Palatinate located in western Germany. The Meess family, which at the time included Georg, Elizabeth, Jacob and his brother Heinrich (Meess was changed to Maeys after 1844 by Jacob), immigrated to the United States when Jacob was only four years old. The Maeys family moved around Pennsylvania for a number of years before the family of seven moved west to Illinois when Jacob was thirteen years old. 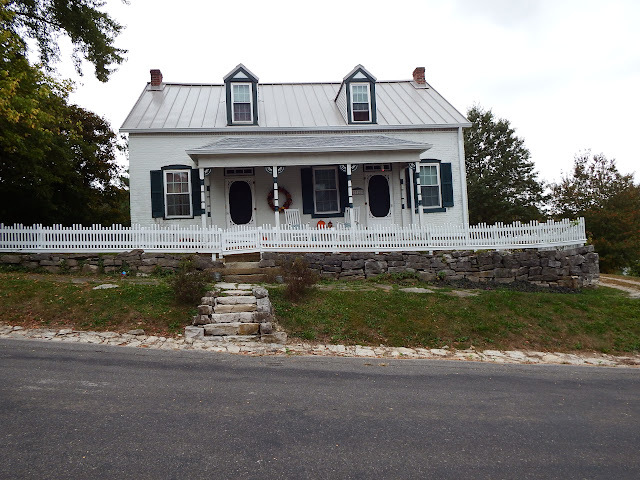 After first moving to a location in the northern portion of Monroe County, the family settled on the Lawson Farm, located in the American Bottom and also in the northern portion of the county, where they rented land to farm. However, a dark time in their lives was about to begin: the Maeys lost their entire crop to the flood of 1844, which caused countless families untold hardships, and devastating sickness soon followed. Early the next year, the family moved to a farm about a mile northeast of the current village of Maeystown. Unfortunately, only six weeks after moving to this new farm, Jacob's father, George, passed away, which left Jacob, as the oldest child at sixteen, in charge. His family was now entirely dependent on Jacob for its support, rightly marking a new chapter in Jacob Maeys' life. Fortunately, Maeys succeeded in his new role as his family's leader. He continued to farm the land that was rented by his father and split rails and earned money doing whatever he could. In 1846, Maeys rented the McRoberts farm, one mile north of today's Maeystown, and moved his family there. By 1848, Maeys had accumulated enough money to buy McRoberts Meadow (Survey 704, Claim 316), though he did not move there until 1852. He bought the tract due to the large spring located on the property and intended to create a saw mill for lumber. Maeys moved to his new property in 1852, when he built a one-room log cabin and the sawmill. At that time, there were no other settlers and not the thriving village found there during the latter half of the nineteenth century. In the following year, Maeys wed Barbara Fisher, who was also a German immigrant from Osthof in Hesse-Darmstadt, which is in the western central part of modern Germany. Due to the sluggishness of the stream that it was built over, the mill did not have enough of a water flow to operate. Maeys converted to steam power within a year, which made the mill successful for the next three years until Maeys sold his share to his partner of three years and became a farmer again. 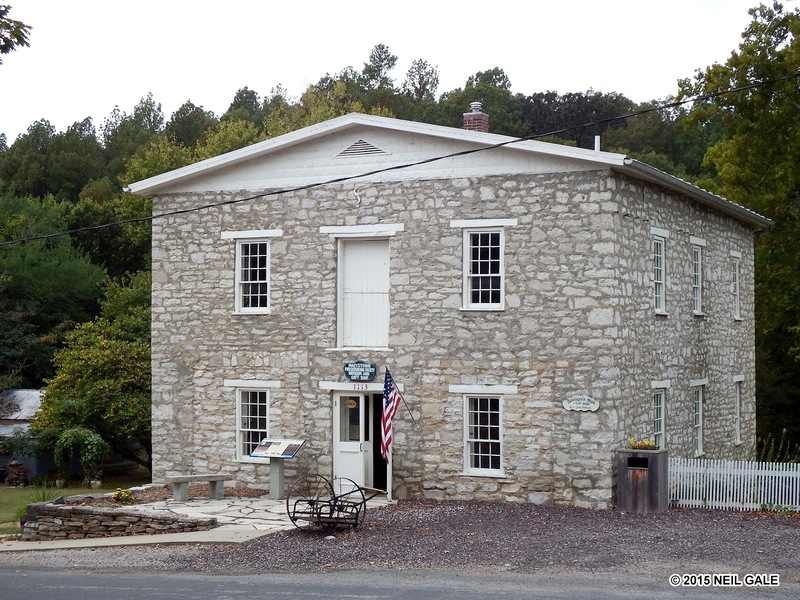 In 1858, Maeys decided to partner with Abraham Poston, who owned the general store in Maeysville (the original name of the town). By this time, Maeysville, obviously a name dedicated to Jacob Maeys, had grown to include about two dozen houses. 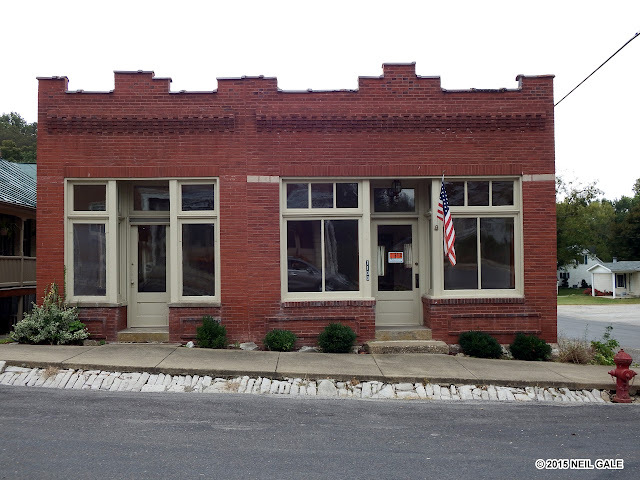 Due to its growth, Maeysville gained a post office in 1860, of which Maeys was postmaster. The new post office was located in the store, making it convenient for Maeys who worked there. In 1867, Maeys bought out Poston's interest in the general store and took over the entire business himself, which he carried out along with continuing his farming. The Tavern at Maeystown - still in operation, serving lunch and dinner seven days a week, and breakfast on the weekends. 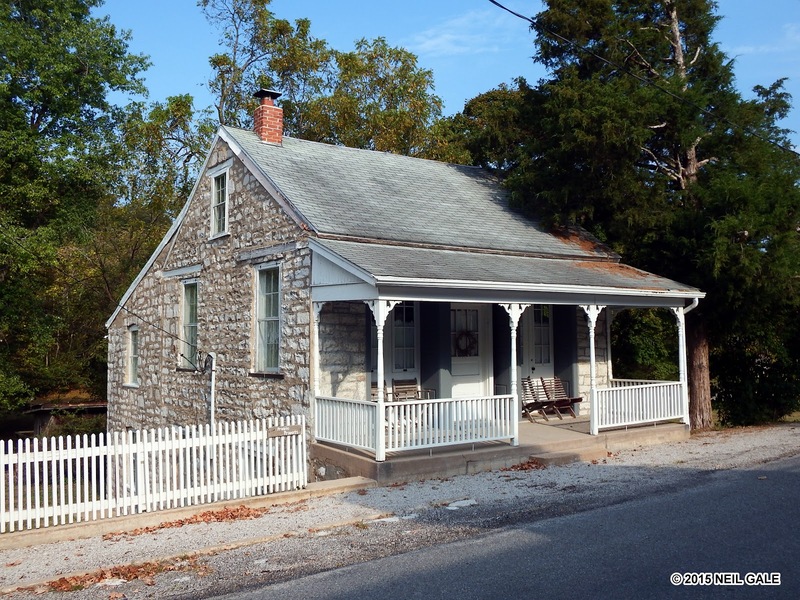 Sometime during the Civil War, Maeys constructed a new brick house for his wife and five children. Barbara passed away in 1880; a year-and-a-half later, Jacob married Christine Driemeyer, who was a native of Wersen, Prussia. Maeys fathered six more children during his marriage to Christine, though four of them died soon after they were born. Jacob Maeys was a self-motivated man and very well-respected in the area. He was a resident of Monroe County from 1841 until his death in 1913 caused by a fall down his cellar steps when he was eighty-four. He was considered one of the best citizens in the county. His story is truly a memorable one with his trying early years, having to lead his family at an early age and his success against all odds to become a prominent member of the county. He led himself through adversity to become successful in life. He went from renting farmland with crops destroyed by a flood to owning about a thousand acres, mostly farmland, in the American Bottom, by 1875. With his death, Maeystown lost its successful founder and the community lost one of its best and energetic citizens. 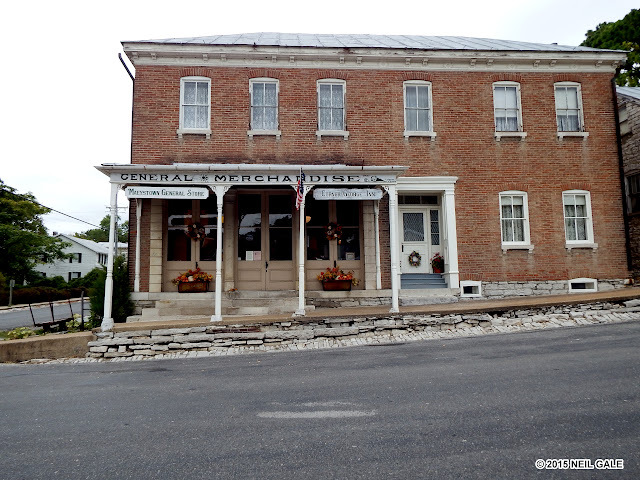 Officially, Maeysville became a town in 1852 and the name changed to Maeystown in 1860 when the community gained a post office, due to there being another town in Illinois with the name Maeysville. In late 1856, Maeys decided to have his property laid out in 66-by-120 foot lots to become the village of Maeysville. Maeys platted his land to sell to the numerous German immigrants that arrived in the area. German immigrants coming to St. Louis via New Orleans learned of the hilly Maeystown and bought land there. While most of the immigrants were from portions of Bavaria and Hessen, there were also quite a few with ancestral homes in other parts of Germany, such as: Westphalia and Wersen in Prussia, Schaumburg-Lippe (in northwestern Germany), Duchy of Nassau (in western Germany) and Dukedom of Mecklenburg-Schwerin (in northeastern Germany). Within six years, more than two dozen lots had been sold. Most of the Germans who settled in Maeystown were part of the Forty-Eight movement who left Germany for economic and political reasons. In deciding where to settle, German immigrants mostly chose distinctly German communities so they would be with people of their own nationality. As previously mentioned, they also chose land which reminded them of home. They wanted surroundings which made them feel as comfortable as possible in a new world. With its steep hills, wooded surroundings and abundant streams, Maeystown seemed to be an ideal location for a new German community. Many Germans decided to settle there and the village began to grow. Many of the original citizens of the village came directly to Maeystown or first settled in other areas of Monroe County and later moved to Maeystown. 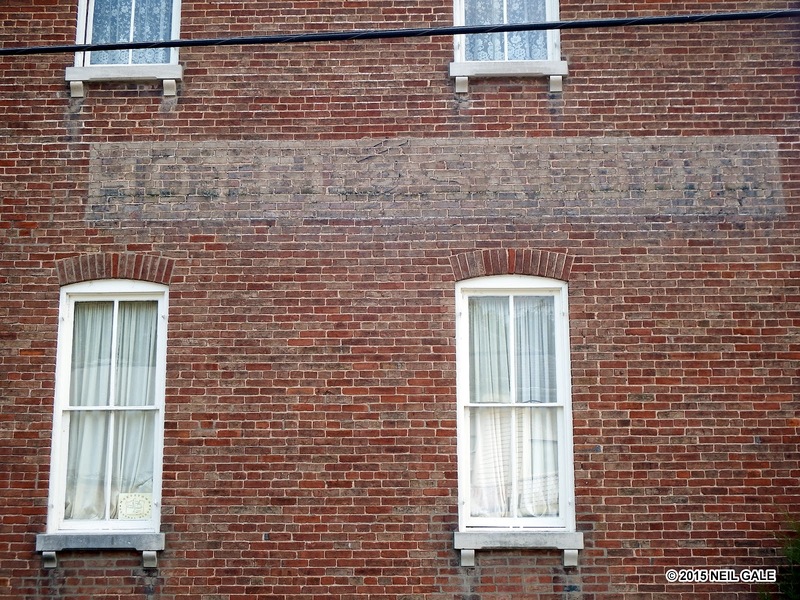 Many of the German immigrants who came to settle in Maeystown were not farmers, but tradesmen and professionals who had something to offer the community. The variety of trades and professionals as well as farmers made the community almost self-sufficient. Besides Maeys, the first citizens of Maeystown included: Ludwig (Louis) Ahlheim, cooper; Peter Bickelhaupt, blacksmith; John Coleman, carpenter; Jacob Empt, vintner; Martin Fornbauer, stone mason; Jacob Hoffmann, tavern owner and brickyard operator; Sebastian Holzmeier, carpenter; Ludwig (Louis) Krone, shoemaker; Jacob Pilliard, sawmill operator; Abram (Abraham) Poston, mercantile owner; Peter Ray, horse trader and tavern owner; Adam Ruch, butcher and peddler; John Schaefer, hotelier; Carl Siebenmann, wagonmaker; Heinrich Quernheim, furniture maker and undertaker; Charles Wilhelmj, doctor; Heinrich Wippermann, tailor; and Anton Zeitinger, miller. Most men had their businesses in their homes, except for the mill and general store, which had a hall above. As for the reason why so many Germans settled in Maeystown during this short span of years, today it can only be speculation. No one knows the true reason why this became an all-German community, what drew the immigrants to this little town in the bluffs of southern Illinois. Some speculation exists that Jacob Maeys spent time at the boat landings south of Maeystown and the not-too-distant St. Louis, Missouri, and spread the word of his building a traditional German community in the Illinois countryside. Perhaps, as the German immigrants traveled up the Mississippi River and the boats made their stops along the way to St. Louis, they heard word of Maeystown and wanted to settle there. Perhaps it was Maeys' sawmill that sparked settlement in Maeystown. Inevitably, sawmills were magnets for settlement due to readily available cut lumber. No one knows the true reason since there was no defined plan of settlement. The settlers of Maeystown and their descendants preserved their cultural heritage well throughout the years. The Germans carried on their culture, traditions and way of life, while still adapting to life in America. German was the only language spoken in the town for decades and this tradition was retained even longer in the homes. German celebrations were also retained in the community and are still celebrated. This is a GREAT article. I have family from here, Fults, Renault and Waterloo. Thank you for all the info.